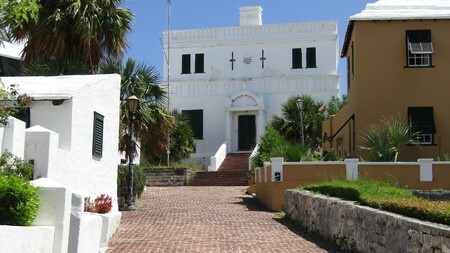 The old State House also known as the old Session House, is the oldest building in Bermuda built in 1620. It was also Bermuda's first building that was built with all lime stones. The building, located in St. George was earlier the parliament house where cabinet sessions were held regularly until 1815. The following year, Bermuda's capital was relocated to Hamilton city. And the strange part is, this entire building was given away on a rent to Scottish Freemasons for a paltry amount of 1 peppercorn per year. Since then an elaborate Peppercorn Ceremony is held in the historic town of St. George at King's Square to mark this occasion every year in late April. Turtle oil and lime have been used as mortars to bind the limestone blocks of the building. In 1620, the then Governor Nathaniel Butler felt that Bermuda enjoyed the same latitude and hence similar climate as Italy, and therefore the building should be of Italian architecture. His idea was to setup a trend for Bermudian home and building style. As a result, this flat roofed building was built as the parliament house. Stones were used mainly because of fortifications. However in reality, Bermuda's weather and that of Italy differ vastly. There is a lot more rain fall in Bermuda. So the flat roof started becoming a big problem due to water clogging on the flat surface, which frequently resulted into water seepage through the porous limestone blocks. Subsequent Bermudian buildings did not follow this flat roof architecture for obvious reasons. What became popular were the gabled limestone roofs that directed the rain water to the gutter and down into the water tanks. In Bermuda, there is scarcity of fresh water and therefore this is the only way most Bermudian families store water. And the limestone on the roofs act as filters to provide clean water. On the other days, you can only see from outside. Visit the Tourist Map to view the location and other attractions nearby. 1) Check out Bermuda Museums for great museums & historical buildings in Bermuda. 2) Check out Bermuda Must See Places to know about the top places to visit in Bermuda. 3) Check out St George's Town to know about the historical Town of St. George, its attractions, activities, restaurants, hotels and more. 4) Check out St. George's Parish to know about the parish where the town of St. George is located and all its attractions and activities.